Two Americans Held In North Korea Are Back On U.S. Soil : The Two-Way Kenneth Bae, a Christian missionary detained in late 2012, and Matthew Todd Miller, arrested in North Korea earlier this year, came home Saturday. 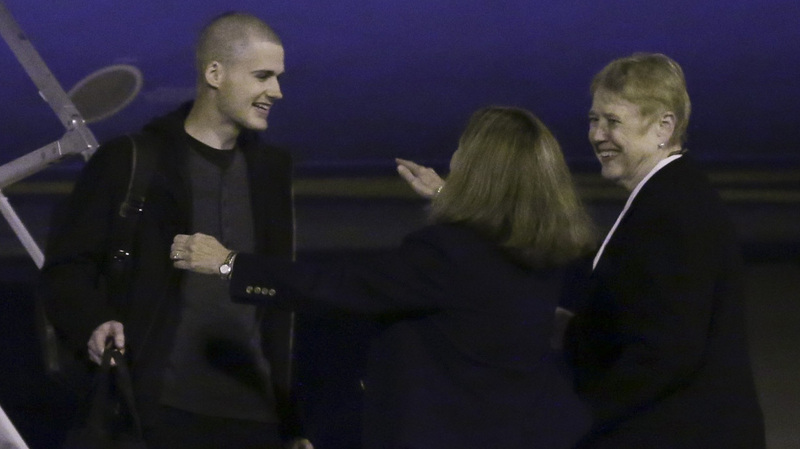 Matthew Miller, who had been held in North Korea since April, 2014, is greeted by two unidentified women after arriving Saturday at Joint Base Lewis-McChord, Wash.
Americans Kenneth Bae and Matthew Todd Miller, held for months in North Korea, received a joyful homecoming Saturday as their plane set down at Joint Base Lewis-McChord, south of Seattle. Bae, 45, a Korean-American missionary and tour guide from Lynnwood, Wash., thanked family and supporters for not forgetting about him during his detention. "It's been an amazing two years, I learned a lot, I grew a lot, I lost a lot of weight," Bea said at a press conference at the base. Bea was convicted of trying to overthrow the Pyongyang regime and sentenced to 15 years hard labor. He was detained in late 2012. "Members of Bae's family, who live nearby, met him when he landed. His mother hugged him after he got off the plane. Miller stepped off the U.S. government aircraft a short time later and was also greeted with hugs. Neither Miller nor anyone in his party met the media." Bae was reportedly leading a tour group to North Korea when he was arrested. After his detention, he said in an interview that his health was failing. Bae's son Jonathan described his father's release as "awesome" and said he "couldn't be happier" about it, according to Reuters. Miller, 24, a tourist from Bakersfield, Calif., was arrested in April and sentenced to six years on charges of espionage. Pyongyang claimed that Miller tore up his visa and asked for asylum so he would be thrown into jail where he could investigate alleged human rights abuses there. The two, released together, were being accompanied on a flight out of Pyongyang by James Clapper, director of national intelligence, his office said. U.S. officials were tight-lipped about the logistics of the handover and the circumstances of the pair's release, including whether Clapper met with North Korean Leader Kim Jong Un or other senior North Korean officials, according to The Associated Press. They said the timing was not related to Obama's imminent trip to China, Myanmar and Australia, the AP says. President Obama, speaking at the tail end of a news conference announcing his nomination of Loretta Lynch to the post of attorney general, said on the release of Bae and Miller: "Wonderful day for them and the families — grateful for their safe return and I appreciate Director Clapper, who is doing a great job on what was obviously a challenging mission." The U.S. State Department said in a statement that it was grateful to Clapper "who engaged on behalf of the United States in discussions with DPRK authorities about the release of two citizens" and also thanked international partners "especially ... the government of Sweden, for their tireless efforts to help secure the freedom of Mr. Bae and Mr. Miller." 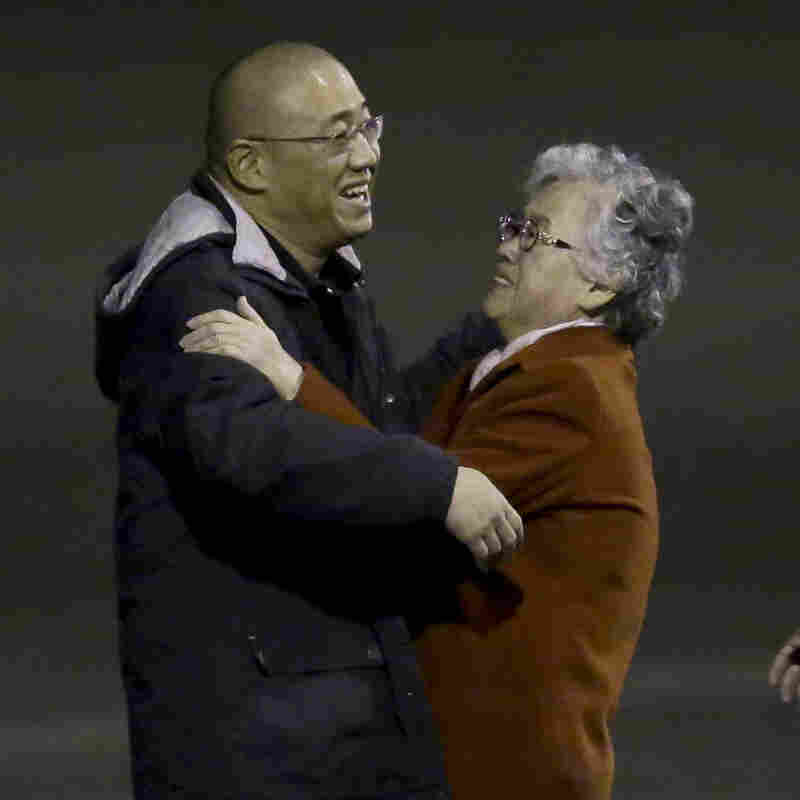 The release of the two comes weeks after another American detainee in North Korea, Jeffrey Fowle, was set free. With today's release of detainees, there are no remaining Americans thought to be in North Korean custody. Fowle, 56, of Miamisburg, Ohio, was arrested in June. After his release, Fowle said he had attracted the attention of authorities after leaving a Korean/English Bible in a public bathroom in a restaurant and bar in Pyongyang.